Gifts For Beekeepers: Which Among These 15 Gifts Is Best For Your Beloved? Beekeeping is a popular new trend because bees play an essential part in the global ecosystem. Beekeeping can be a fun hobby, or a new career, which also has a positive effect on the world. If you know someone interested in beekeeping, these gifts for beekeepers are an excellent opportunity to encourage them. Whether you are shopping for a first-timer or a seasoned pro, you can find a gift that matches your apiarists' needs. If you don’t know a drone from a queen, don’t worry – we’ve got you covered. You’ll find everything you need to choose the right gift for your bee-loving friend. If you haven’t tried beekeeping, you may be wondering what it’s all about. To buy the right gift you need to understand what your loved one sees in beekeeping and what they need to do it. The appeals of beekeeping can be broken down into three categories: environmental; economic; entertainment. Bees serve a crucial role for our planet, as they pollinate our plants for us. Tending to a colony of bees encourages plant life expansion, and keeps current fields healthy. Bees also produce valuable honey and wax. Products created with bee colony output provide goods for the owner to use or to sell. The final reason to get into beekeeping is simple – it’s fun! A bee colony is fascinating to watch. It’s not every day you get to suit up in a full-body suit and wade into a swarm of stinging insects – unless you’re a beekeeper. One of the benefits of shopping for gifts for beekeepers is how varied supplies are. The average beekeeper needs everything from hives down to brushes and clips. That means you have a lot of options when looking to buy a gift. The basics of beekeeping include hives, protective suits, and tools for harvesting. With a suit on and the right set of tools, a beekeeper does all their work on the hive. Inspections ensure the colony is healthy and honey is gathered to create delicious products. The beekeeping hobby is spreading to more and more people, so it’s important to know your loved one’s experience. A professional beekeeper tending to dozens of hives likely has different needs than a hobbyist trying beekeeping for the first time. Buying a hive for a beginner is a more wide open choice, for example, than for a full-timer. Friends making a living off beekeeping likely have a favorite style, so it would be important to match their other hives, whereas beginners have no such preference giving you more options. When purchasing a book, keep experience level in mind. Beginners don’t require a book on advanced techniques, while a beginner's guide may offend an experienced apiarist. Here at BeeKeepBuzz, we know that not everyone is an expert on beekeeping. To help you find the best gifts for beekeepers, we have compiled a list of great products. All the items on our list received stellar ratings from consumers. When seeking out gifts for beekeepers, you will find that prices span a broad range. This is terrific news for you because it means there’s always something in your price range. Some bee-related accessories are available for less than $10. On the high end, quality equipment costs hundreds of dollars. Don’t be intimidated by the pricier items if you’re on a budget. The less-expensive gifts are still excellent choices for the beekeeper in your life. Our list is grouped them by type -- Books, Accessories, Gear, Big Gifts, and Best of the Rest. Every item here is a great gift, listed in no specific order. Books are always a favorite gift. Whether your apiarist is a novice, hobbyist, or an experienced professional, books are great for any occasion. A fantastic choice for any new beekeeper, this book covers every step in the process, from setting up hives through harvesting and using byproducts. Detailed illustrations help beginners understand processes which are new to them. Beekeepers love making products with their bees’ wax and honey. This book is a great fit for any beekeepers looking to expand their range of output. It covers a wide range of products from candles to soap to healing salves. This book also works for an aspiring beekeeper looking to experiment with store-bought wax before making a major commitment. Every beekeeper needs to take notes for an efficient honey farm. From observations on colony health and behavior to recording harvesting hauls, this journal has beekeepers covered. Beginners receive added help in how-tos, recipes and more, but experienced beekeepers will gain less from the annotations. Every beekeeper needs equipment to maintain their hives. While your apiarist may already have these items, they might need an upgrade or replacement of worn tools. We've selected accessories with low to mid-range prices. We tried to cover several ranges of affordability no matter what your budget is. Smoke has a calming effect on bees, which is why a good smoker is essential for any beekeeper. The smoker features a protective heat shield to reduce the risk of injury when in use. It is easy to light, using pieces of newspaper as a starter then adding wood for fuel. Experienced beekeepers likely have their smoker of choice. 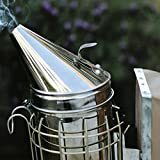 Only purchase this smoker for a veteran apiarist if you know they are in need of an upgrade or replacement. Beekeepers handle their queen bees with great care because they are the heart of a hive. Keeping the queen healthy is essential. When a queen must be gathered, such as for moving or marking, these clips are vital. The clip secures the queen safely preventing her from injuring herself during the process. Perfect for a beginner or experienced honey harvesters. Adjusts to fit over a variety of sorting receptacles. 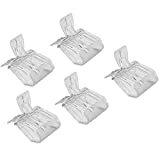 Two-layer straining provides pure results. Stainless steel resists rust. DOUBLE SIEVE - This honey strainer is designed with two separating screens for effective honey filtering. Protective gear is something that all beekeepers need. While prices on these items run in the mid-range, they are still quite affordable. An effective hat and veil is a must for all beekeepers which is comfortable to wear without sacrificing protection. Not required by beekeepers who prefer full suits or jackets with their veils. One size fits all. This hood and jacket protect the upper body and head at the same time. Unisex design fits both men and women. Pockets to hold small accessories helps make the wearer’s day easier. Arms and waist feature elastic to create a tight seal and keep bees out. Thumb loops prevent sleeves from slipping up the wearer’s arms. Handling bees require proper hand protection. These gloves are thick enough to protect with ventilation to keep hands comfortable. Gloves extend 16 inches beyond wrist to thoroughly cover the sleeves of the wearer's jacket. Using these gloves without protective covering or regular cleaning can lead to the acquisition of scents which aggravate the hive. If you have a bit more in your gift-giving budget, these items will all make perfect gifts. They fall on the pricey side but will offer years of service for your beekeeper. Everything a new beekeeper needs to get started with the hobby. The kit includes one hive, a smoker, gloves, a veil, a hive tool and book of beekeeping basics. This kit is not an ideal gift for any established beekeepers. This hive arrives pre-assembled for speedy utilization in the field. 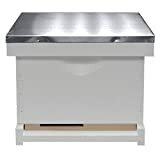 A high-quality hive for beekeepers of all experience levels, however, experienced beekeepers likely have preferred hives already and may not be inclined to change brands. Increasing the rate of honey extraction increases a beekeeper's productivity. This extractor uses a hand crank to extract honey from combs rapidly. Newer beekeepers are unlikely to require this level of extraction, which combines with the high price to make this less suited for beginners. If all else fails and you have no clue what your beekeeper needs, these failsafe gifts might help. They fall in the low to mid-range of prices. Sharing a hobby with a child is a great way to bond. Toys which introduce beekeeping to an apiarist’s kids make great gifts for beekeepers. 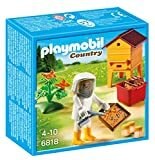 This Playmobil set introduces a young child to beekeeping. Hives need to have bees, and one way to fill a hive is with the use of a swarm lure. Spraying Swarm Commander attracts a swarm allowing the beekeeper to use the swarm to fill a hive. Although Swarm Commander is designed to help attract swarms, using a lure does not guarantee successful swarm capture. ​One thing beekeepers have in common is a love of bees! This soap utilizes natural honey to create an effective and pleasant smelling bar. This product would not be an ideal gift for a beekeeper who is not inclined to use fragrant soaps. Oatmeal + Honey Triple Milled Natural Body Bar Soap, Gentle Enough to Use on Your Face! After reviewing everything, we've listed what we think are the best of the best below. If you plan to buy one book, this one is the way to go. The Beekeeper's Bible: Bees, Honey, Recipes & Other Home Uses covers every part of the beekeeping process. Your beekeeper will be ready to get started tending a hive and making great products in no time. There are a lot of pieces to getting started with beekeeping, so a set which covers all the bases is at the top of any list of gifts for beekeepers with no experience. Your friend or loved one will be able to jump right into the hobby with everything they need for safe, fun participation. 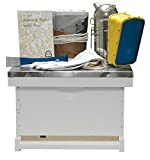 This is an invaluable product for a beekeeper in your life who produces a great deal of honey but is still hand sifting. Making their production more efficient adds time into their day, and everybody loves having more time. Which gift caught your eye? If you have a favorite for the beekeeper in your life, let us know in the comments.